Attorneys provide cheer for less fortunate through Oklahoma County Bar Association Community Service Committee - Phillips Murrah P.C. Since the last update, the Community Service Committee continued its annual holiday tradition of providing some holiday cheer to the less fortunate. For many years, members of the Committee have provided Christmas gifts to juvenile residents of Family Junction, a youth shelter that is part of Youth Services of Oklahoma County. Family Junction houses juveniles who, due to circumstances beyond their control, are not able to live at home. These children are placed at Family Junction because their parents are incarcerated, have drug or alcohol problems or a myriad of other issues that prevent them from providing a safe environment for the children at home. Members of the Committee received wish lists from the children and either purchased gifts from the wish list or donated money to be used for the purchase of gifts. In December, the Committee sponsored a holiday pizza party for the children at the shelter, during which Committee members and OCBA staff provided the children with stockings containing candy and a small amount of cash for fast food treats. Committee members Judge Patricia Parrish, Ray Zschiesche, Ken Stoner, Chance Pearson and Honorary member Sam Stoner with residents of Oak Hills. 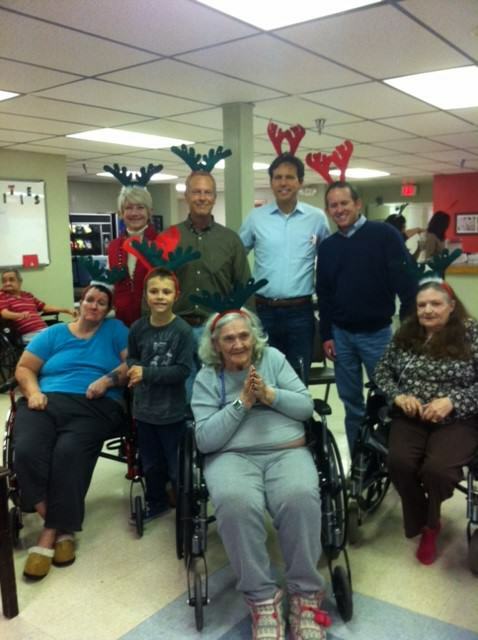 The Committee also provided a holiday party for residents of the Oak Hills Nursing Home in Jones, Oklahoma. Oak Hills is a facility that cares for those who are destitute and cannot otherwise afford nursing care at other facilities. Committee members provided snacks, sparkling cider and reindeer antlers for residents to wear, and Judge Parrish arranged for John Hochgraefe and Steve Coleman, “The Elderly Brothers,” to perform oldies hits. Committee members visited and danced with the residents, and some residents even got up out of their wheelchairs to join in the dancing. Committee member Ken Stoner attended and brought nine year-olds Sam Stoner and Easton Chavez to join in the festivities. Sam and Easton brought an energy to the party and the dance floor that was much appreciated by the committee and residents, alike. In February, the Committee collected donations to refurbish visitation rooms at the Juvenile Justice Center. DHS has a number of rooms at the Center, which are used to allow parents to have supervised visitation with their children. The funds collected by the Committee were used to purchase furniture and changing tables, to help provide a comfortable setting for these supervised visits. The refurbishing activities at the Center continue, and if anyone would like to make a tax-deductible donation to help with this work, checks can be made payable to Citizens For Juvenile Justice, a 501(C)(3) corporation, and dropped off at the OCBA office. In March, the Committee provided Spring Break activities for the residents of Family Junction and in April the Committee provided plastic eggs filled with treats and dollar bills for an Easter egg hunt for the kids. 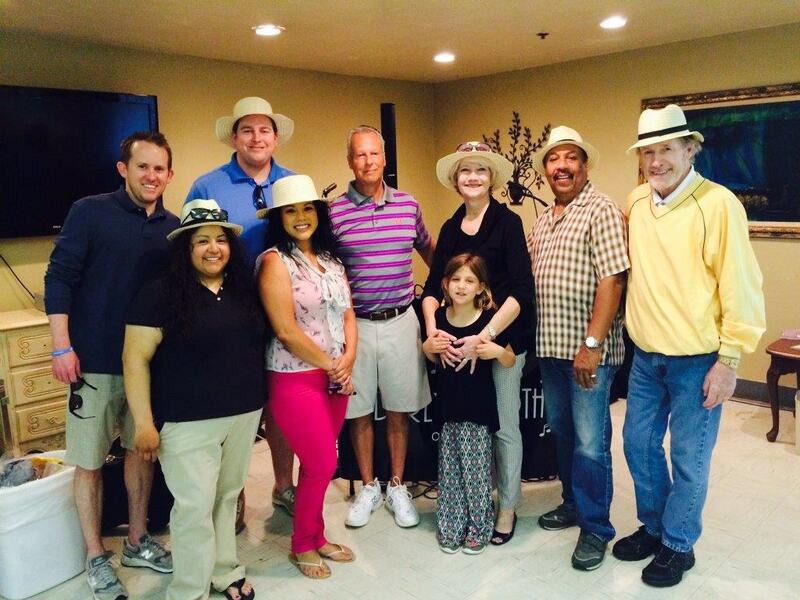 Committee members Chance Pearson, Monica Ybarra, Ray Zschiesche and Judge Patricia Parrish, Honorary member Taylor and guests Ivonne Molina and Travis Weedn with the Elderly Brothers at the Spring Fling party. In April, the Committee hosted a Spring Fling party for the residents of Edwards Redeemer Nursing Center. Judge Parrish again arranged for the “Elderly Brothers” to entertain the residents with music and recruited her granddaughter, Taylor, to help with party preparations and dancing. All of the residents received straw hats and sunglasses so they can be in style for the summer, and all the cookies they could eat. Judging from the smiles on the faces of the residents and Committee members, the Spring Fling was a great success. The Community Service Committee always welcomes new members to participate and make a small difference in the lives of those less fortunate. Anyone interested may contact Ray Zschiesche at (405) 235-4100 or Chance Pearson at (405) 239-6040.